Growing Champions empowers children who come from low income groups and abusive, drug and gang infested homes to find the champion within and lead their lives. We use sport, character development and academic support to build our future leaders and keep them on a healthy path. Growing Champions is a leadership and football development program run by professional coaches with in sport and personal development. Living and Living magazine did a feature article on Growing Champions for their July issue in their "we care" section. We are proud of our boys and development coaches for the positive growth we have experienced over the past 12months. Big thanks to Spar for the R5,500 food voucher, and also, Living and Loving for the exposure. Not everyone is a candidate for live-in alcohol and drug rehabilitation we offer an extensive Outpatient Program that brings the addict in regularly during the week for group education and counselling. Individual counselling and twelve step assistance is also available. We also offer Sober House residential facilities to those who may require a structured and controlled live-in alcohol and drug free regulated environment, which will assist individuals in integrating back into a healthy life style. Despite the differences between some outpatient treatment programs, the goal is always the same: help individuals recover from drug or alcohol addiction so that they may lead a healthy and self suffient drug and alcohol free life. 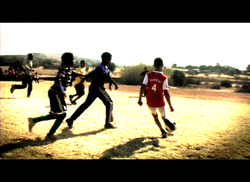 It's been one of our goals to register a football club to compete in the local Eldorado Park Legue. Our boys and gals make up 3 teams in different age groups. They train daily and play with all their heart. We have managed to raise funds for their soccer kit, so no playing any matches with broken shoes and torn t-shirts. The spirit in the camp is always at a high, our little champs love the game, and thanks to Enver, are well organised. Our soccer coaches work hand in hand with our character development coach, Sam, and together they develop our boys' skills, mental attitude and ambition. For us it's not about winning, but the attitude with wich they step on and off the pitch.